Mülheim, November 7, 2018 – Turck has added M12 field wireable connectors with integrated push-in connection technology to its connectivity portfolio. The technology enables the user to complete rapid and safe manual assembly without the use of any tools. Soldering irons or screwdrivers are not required either. The customer just has to insert a stripped single wire end into the required contact area and establish electrical contact at the same time through the mechanical locking mechanism. This enables mounting to be completed easily and reliably even in restricted mounting conditions. 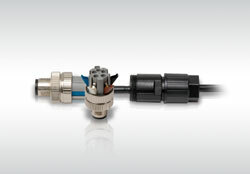 Besides field wireable connectors and customized solutions, Turck's connectivity portfolio also includes field wireable connectors in M8 × 1/Ø 8 mm, M12 × 1, 1/2”, 7/8”, M16 × 0.75, M23 × 1 designs as well as valve connectors. Field wireable connectors can be adapted to individual requirements in the field. They therefore simplify installation wherever cable lengths cannot be estimated in advance.